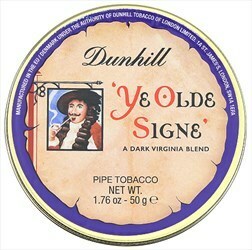 Ye Olde Signe is a richly fermented, straight Virginia in a fine ribbon cut. The process used to produce the tobacco creates a natural tea-like tin aroma and results in a natural-tasting tobacco that has a mellow sweetness and subtle aroma. In spite of the gentle flavor, this is a very robust blend best enjoyed after a meal. See for yourself why so many longtime Dunhill fans consider this one of their very finest.